Floating cities, jet packs, and cyborg bodies; they're all part of the amazing future we're still waiting for. At Accoutrements, we have been working feverishly to make that bright future a reality. 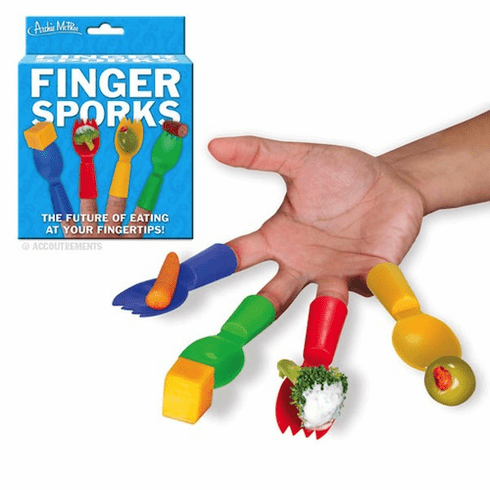 Introducing Finger Sporks, instant robotic enhancements for your fingertips! Regular humans pick up one bite at a time, but a Finger Spork-wearing superhuman can scoop up four cyborg-size bites at once! Four vinyl 3-1/2" tall x 1-1/4" wide (8.9 cm x 3.2 cm) Finger Sporks in four bright colors.